The pivotal year I went to Hopi, my destination was the home of Thomas Banyacya Sr who had passed away a few years before. In that moment, unbeknownst to me, something bee-ish, full of grace, slipped under my radar and into the heart of my life. When people ask me when I became a beekeeper, I realized that it was in that moment. By the end of that year, I was in bee school and the bees got me, body and soul. They are some of the greatest teachers of my life and I have been at their feet ever since (all six of them). If you enjoy the Prasad for Women talks and are so moved to make a donation, it will be gratefully received. 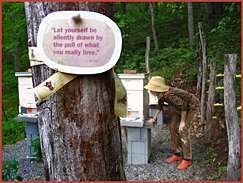 Your gift helps to support my bee sanctuary (and holy bee habit). Content of the Prasad for Women CDs by Debra Roberts. Drumming & recording by River Guergerian. All rights reserved. © 2013 Debra Roberts. All rights reserved.